The objective was to isolate and characterize the secondary metabolites of Heracleum pastinaca, which has not been previously investigated. Conventional chromatographic procedures were carried out for isolation of the compounds. The structures of the compounds were elucidated by extensive 1D and 2D nuclear magnetic resonance spectroscopic analysis in combination with mass spectrometry experiments and comparison with the relevant literature data. 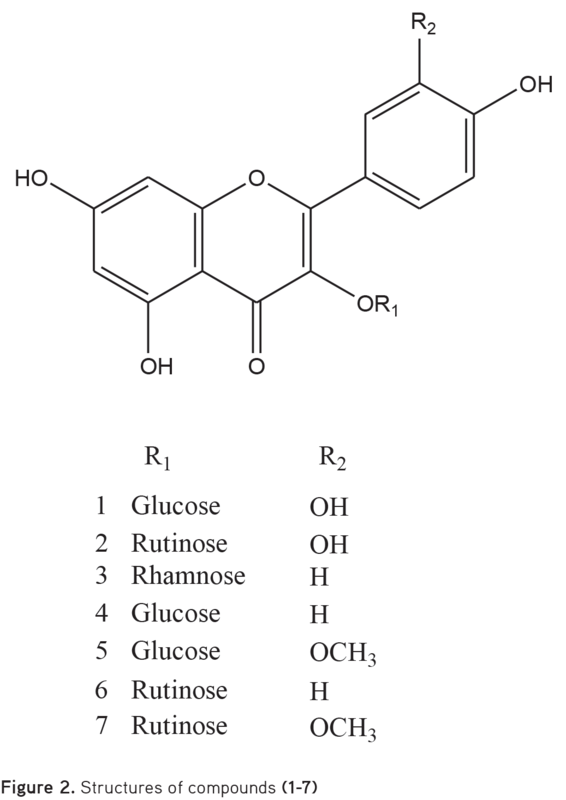 This first phytochemical investigation on all parts of H. pastinaca Fenzl led to the isolation and identification of seven known flavonoid glycosides: isoquercetin (1), rutin (2), afzelin (3), astragalin (4), isorhamnetin 3-O-glucoside (5), nicotiflorin (6), and narcissoside (7). This is the first report on the isolation of these flavonoid glycosides from H. pastinaca and compounds 3, 5, 6, and 7 from the genus Heracleum. Conventional chromatographic purification procedures were carried out to isolate the compounds of H. pastinaca. The structures of the compounds were elucidated by extensive 1D and 2D nuclear magnetic resonance (NMR) and electrospray ionization (ESI)-mass spectrometry (MS) experiments confirmed by the relevant literature data. The chemotaxonomic significance of the compounds was discussed. NMR spectra (400 MHz for 1H NMR, 100 MHz for 13C NMR, both use TMS as internal standard) were measured on a Bruker AM 400 spectrometer and MS spectra on a LC/MS Shimadzu 8040 instrument. Kieselgel 60 (Merck, 0.063-0.200 mm) was used for open column chromatography (CC). Sephadex (SP) LH-20 (SP LH-20) (General Electrics Healthcare) was used for gel permeation chromatography. LiChroprep C18 (Merck, 40-63 µm) was used for medium pressure liquid chromatography (MPLC) (Buchi Pump Module: C-601, ultraviolet (UV)-Photometer: C-640, control unit: C-620, Fr. Collector: C-660). Thin layer chromatography (TLC) analyses were carried out on pre-coated Kieselgel 60 F254 aluminum plates (Merck). Compounds were detected by UV fluorescence and spraying 1% vanillin/H2SO4, followed by heating at 100°C for 1-2 min. Whole parts (aerial parts and roots) of H. pastinaca were collected from the Maden-Kızıltepe region (Niğde-Ulukışla), at about 2600 m altitude from calcareous rock clefts on August 2017. A voucher specimen was deposited at the Herbarium of Hacettepe University Faculty of Pharmacy (code HUEF-17015). The dried and powdered whole parts of H. pastinaca (90 g) were extracted with MeOH (500 mL×4) at 37°C. After the evaporation of the solvent (yield 18%), the crude MeOH extract (17 g) was first dissolved in water and then partitioned between n-hexane and n-BuOH. n-BuOH (4.5 g) extract was first submitted to CC on Sephadex LH-20 (2.5×60 cm) and eluted with MeOH. Four main fractions (Fr) [Fr. 1 (1.7 g); Fr. 2 (2.2 g), Fr. 3 (332.6 mg), Fr. 4 (130 mg)] were obtained. Fr. 3 (332.6 mg) was submitted to a reverse phase column (1.5 cm×15 cm) and eluted with a gradient H2O:MeOH solvent system (10%® 50%; 10 mL/min; 4-5 mbar) with the MPLC system coupled with a fraction collector to give four subfractions (Fr. 3a-d). Fr. 3d gave compound 3 (4 mg). Further purification of Fr. 3a (116 mg) with a reverse phase column (1.5 cm×15 cm) and elution with a gradient H2O:MeOH solvent system (20%® 30%; 10 mL/min; 4-5 mbar) yielded two subfractions. These two fractions were submitted to a TLC plate (20×20 cm) separately and eluted with 70:30:3 (CHCl3:MeOH:H2O) to yield compounds 1 (22 mg) and 2 (32 mg), respectively. Fr. 3c (63 mg) was submitted to two different TLC plates (20×20 cm) and eluted with 70:30:3 (CHCl3:MeOH:H2O). After elution, the bands belonging to the compounds were detected under UV254 light and scraped to obtain compounds 4 and 5 (24 mg) and compounds 6 and 7 (16 mg), respectively, as mixtures. Yellow powder; Negative ESI/MS m/z: 463 [M-H]-; 1H NMR (400 MHz, MeOH-d4) δ 7.72 (d, J=2.1 Hz, 1H, H-2ʹ), 7.58 (dd, J=8.5, 2.1 Hz, 1H, H-6ʹ), 6.86 (d, J=8.5 Hz, 1H, H-5ʹ), 6.24 (d, J=2.0 Hz, 1H, H-8), 6.08 (d, J=2.0 Hz, 1H, H-6), 5.11 (d, J=7.6 Hz, 1H, H-1ʹʹ), 3.71 (dd, J=11.8, 2.3 Hz, 1H, H-6aʹʹ), 3.59 (dd, J=12.5, 4.6 Hz, 1H, H-6bʹʹ), 3.56–3.17 (m, 4H, remaining sugar signals). Yellow powder; Negative ESI/MS m/z: 609 [M-H]-; 1H NMR (400 MHz, MeOH-d4) δ 7.68 (brs, 1H, H-2ʹ), 7.64 (brd, J=8.0 Hz, 1H, H-6ʹ), 6.87 (d, J=8.2 Hz, 1H, H-5ʹ), 6.30 (brs, 1H, H-8), 6.13 (brs, 1H, H-6), 5.03 (d, J=7.6 Hz, 1H, H-1ʹʹ), 4.53 (brs, 1H, H-1ʹʹʹ), 3.81 (brd, J=10.5 Hz, 1H, H-6aʹʹ), 3.70-3.20 (m, 9H, remaining sugar signals), 1.15 (d, J=6.2 Hz, 3H). Yellow powder; Negative ESI/MS m/z: 431 [M-H]-; 1H NMR (400 MHz, MeOH-d4) δ 7.78 (d, J=8.9 Hz, 2H, H-2ʹ, 6ʹ), 6.95 (d, J=8.8 Hz, 2H, H-3ʹ, 5ʹ), 6.39 (d, J=2.1 Hz, 1H, H-8), 6.21 (d, J=2.1 Hz, 1H, H-6), 5.38 (d, J=1.6 Hz, 1H, H-1ʹʹ), 4.23 (dd, J=3.3, 1.6 Hz, 1H, H-2ʹʹ), 3.76-3.68 (m, 1H, H-3ʹʹ), 3.53-3.40 (m, 2H, H-4ʹʹ, 5ʹʹ), 0.93 (d, J=5.7 Hz, 3H, H-6ʹʹ). Yellow powder; Negative ESI/MS m/z: 447 [M-H]-; 1H NMR (400 MHz, MeOH-d4) δ 8.04 (d, J=8.8 Hz, 2H, H-2ʹ, 6ʹ), 6.89 (d, J=8.2 Hz, 2H, H-3ʹ, 5ʹ), 6.24 (d, J=1.9 Hz, 1H, H-8), 6.09 (d, J=1.9 Hz, 1H, H-6), 5.27 (d, J=7.3 Hz, 1H, H-1ʹʹ), 3.76-3.57 (m, 2H, H-6ʹʹ), 3.56-3.16 (m, 4H, remaining sugar signals). Yellow powder; Negative ESI/MS m/z: 477 [M-H]-; 1H NMR (400 MHz, MeOH-d4) δ 7.91 (d, J=1.9 Hz, 1H, H-2ʹ), 7.59 (dd, J=8.5, 1.9 Hz, 1H, H-6ʹ), 6.89 (d, J=8.5 Hz, 1H, H-5ʹ), 6.24 (d, J=1.9 Hz, 1H, H-8), 6.09 (d, J=1.9 Hz, 1H, H-6), 5.10 (d, J=7.4 Hz, 1H, H-1ʹʹ), 3.94 (s, 3H, OCH3), 3.76-3.57 (m, 2H, H-6ʹʹ), 3.56-3.16 (m, 4H, remaining sugar signals). Yellow powder; Negative ESI/MS m/z: 593 [M-H]-; 1H NMR (400 MHz, MeOH-d4) δ 8.06 (d, J=8.8 Hz, 2H, H-2ʹ, 6ʹ), 6.89 (d, J=8.0 Hz, 2H, H-3ʹ, 5ʹ), 6.28 (brs, 1H, H-8), 6.12 (d, J=1.8 Hz, 1H, H-6), 5.14 (d, J=7.3 Hz, 1H, H-1ʹʹ), 4.51 (brs, 1H, H-1ʹʹʹ), 3.86-3.62 (m, 2H, H-6ʹʹ), 3.61-3.22 (m, 8H, remaining sugar signals), 1.15 (d, 6.2 Hz, 3H, H-6ʹʹʹ). Yellow powder; Negative ESI/MS m/z: 623 [M-H]-; 1H NMR (400 MHz, MeOH-d4) 7.95 (d, J=1.8 Hz, 1H, H-2ʹ), 7.62 (dd, J=8.5, 1.8 Hz, 1H, H-6ʹ), 6.89 (d, J=8.0 Hz, 1H, H-5ʹ), 6.28 (brs, 1H, H-8), 6.12 (d, J=1.8 Hz, 1H, H-6), 5.02 (d, J=7.3 Hz, 1H, H-1ʹʹ), 4.52 (brs, 1H, H-1ʹʹʹ), 3.95 (s, 3H, OCH3) 3.86-3.62 (m, 2H, H-6ʹʹ), 3.61-3.22 (m, 8H, remaining sugar signals), 1.12 (d, 6.2 Hz, 3H, H-6ʹʹʹ). The present work reports for the first time the characterization of seven flavonoid glycosides, 1-7, from all parts of H. pastinaca. 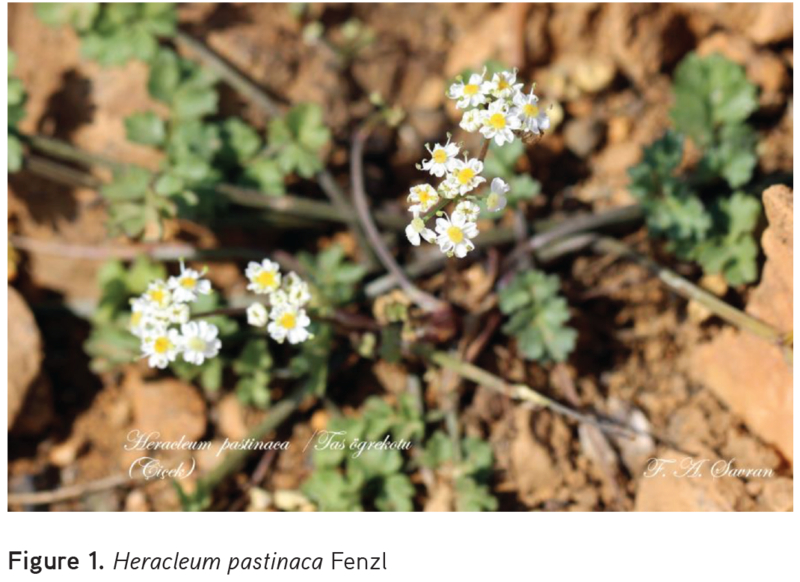 To the best of our knowledge, this is the first report of compounds 3, 5, 6, and 7 from the genus Heracleum, while others were reported from different Heracleum species before, i.e., isoquercetin (1) from H. napalense26 and H. mollendorfii,15 astragalin from H. mollendorfii,15 and rutin from H. sphondylium.27,28 The presence of flavonoids in higher plants has been associated with various environmental conditions, such as high-light/UV stress, cold stress, nutritional deficiencies, and pathogen protection.29-31 The habitats of the samples were at about 2600 m altitude, where the plants were exposed to high UV radiation. This fact should affect the production of different types and quantities of flavonoids in the plant. Phytochemical investigations of Heracleum species have mostly focused on the linear and angular type furanocoumarins, and different biological activities of the genus such as insecticidal, antibacterial, antiviral, and antifungal may be attributed to these coumarin-type compounds.3 There are limited phytochemical studies about the isolation of flavonoids from Heracleum species. A number of flavonoids, i.e., kaempferol, quercetin, isorhamnetin,16 rutin,28 astragalin,15 flavantaside, and epirutin32 were reported from different Heracleum species. In the present study, the isolated and elucidated flavonols were mainly kaempferol, quercetin, and isorhamnetin glycosides. Flavonoids possess many important biological activities such as antimicrobial,33 antioxidant,34 and antiviral.35 The presence of those valuable flavonoids in Heracleum species definitely enriches their chemical diversity and provides evidence for chemotaxonomic studies of Heracleum species and the family Apiaceae as well. This first phytochemical study of H. pastinaca led to the isolation and structure identification of seven flavonoid glycosides. The structures of the isolated compounds were elucidated by 1D and 2D NMR analyses, together with ESI-MS data and comparison with relevant literature data: isoquercetin (1),21 rutin (2),21,22 afzelin (3),23 astragalin (4),21,24 isorhamnetin 3-O-β-glucopyranoside (5),25 nicotiflorin (6),21,22 and narcissoside (7).22 Notably this is the first report of these flavonol glycosides from H. pastinaca and compounds 3, 5, 6, and 7 from the genus Heracleum. In conclusion, when considering the relationship between the bioactivities and the chemistry of Heracleum species, it is a possible that flavonoids can also play an important role in contributing to the bioactivity and traditional uses of Heracleum species. The author is indebted to Dr. Şengül Dilem Doğan (Erciyes University) for her help with the structure elucidation and Dr. Ahmet Savran for identifying the plant material and providing the high-resolution photo of the plant. The Plant List (2013). Version 1.1. Published on the Internet; http://www.theplantlist.org/. (accessed 1st January). Bahadori MB, Dinparast L, Zengin G. The genus Heracleum: a comprehensive review on its phytochemistry, pharmacology, and ethnobotanical values as a useful herb. Compr Rev Food Sci Food Saf. 2016;15:1018-1039. Özgökçe F, Özçelik H. Ethnobotanical aspects of some taxa in East Anatolia, Turkey. Econ Bot. 2004;58:697. Polat R, Cakilcioglu U, Satıl F. Traditional uses of medicinal plants in Solhan (Bingöl-Turkey). J Ethnopharmacol. 2013;148:951-963. Kültür Ş. Medicinal plants used in Kırklareli province (Turkey). J Ethnopharmacol. 2007;111:341-364. Yıldırım B, Terzioglu Ö, Özgökçe F, Türközü D. Ethnobotanical and pharmacological uses of some plants in the districts of Karpuzalan and Adıgüzel (Van-Turkey). J Anim Vet Adv. 2008;7:873-878. Razdan TK, Kachroo V, Harkar S, Koul GL. Furanocoumarins from Heracleum canescens. Phytochemistry. 1982;21:923-927. Steck W. Leaf furanocoumarins of Heracleum lanatum. Phytochemistry. 1970;9:1145-1146. Fischer FC, Jasperse PH, Karlsen J, Svendsen AB. Ein neues furanocumaringlykosid aus Heracleum mantegazzianum. Phytochemistry. 1974;13:2334-2335. Mi J, Peng Y, Zhang H, Wang X, Huo Y, Wang Z, Gao Y, Zhang H. A new benzofuran derivative glycoside and a new coumarin glycoside from roots of Heracleum dissectum Ledeb. Med Chem Res. 2017;1-6.
upta BD, Banerjee SK, Handa KL. Alkaloids and coumarins of Heracleum wallichii. Phytochemistry. 1976;15:576. Nakano Y, Matsunaga H, Saita T, MORI M, KATANO M, OKABE H. Antiproliferative Constituents in Umbelliferae Plants II. : Screening for Polyacetylenes in Some Umbelliferae Plants, and Isolation of Panaxynol and Falcarindiol from the Root of Heracleum moellendorffii. Biol Pharm Bull. 1998;21:257-261. Ghodsi B. Flavonoids of three Heracleum species: H. persicum L., H. sphondylium L. and H. montanum Schl. Bull Trav Soc Pharm Lyon. 1976;20:3-8. Park H-J, Nugroho A, Jung B-R, Won Y-H, Jung Y-J, Kim W-B, Choi J-S. Isolation and Quantitative Analysis of Flavonoids with Peroxynitritescavenging Effect from the Young Leaves of Heracleum moellendorffii. Korean J Plant Resour. 2010;23:393-398. Siwon J, Karlsen J. The isolation and identification of flavonoid aglycones from Heracleum mantegazzianum Somm. et Lev. Medd Nor Farm Selsk. 1976;38:11-12. Skalicka-Woźniak K, Grzegorczyk A, Świątek Ł, Walasek M, Widelski J, Rajtar B, Polz-Dacewicz M, Malm A, Elansary HO. Biological activity and safety profile of the essential oil from fruits of Heracleum mantegazzianum Sommier & Levier (Apiaceae). Food Chem Toxicol. 2017;109:820-826. Firuzi O, Asadollahi M, Gholami M, Javidnia K. Composition and biological activities of essential oils from four Heracleum species. Food Chem. 2010;122:117-122. Iscan G, Ozek T, Ozek G, Duran A, Baser K. Essential oils of three species of Heracleum. Anticandidal activity. Chem Nat Comp. 2004;40:544-547. Babaç MT. Possibility of an information system on plants of South-West Asia with particular reference to the Turkish plants data service (TUBIVES). Turk J Botany. 2004;28:119-127. Han JT, Bang MH, Chun OK, Kim DO, Lee CY, Baek NI. Flavonol glycosides from the aerial parts of Aceriphyllum rossii and their antioxidant activities. Arch Pharm Res. 2004;27:390-395. Chaurasia N, Wichtl M. Flavonolglykoside aus Urtica dioica 1, 2. Planta Med. 1987;53:432-434. Lee SY, So YJ, Shin MS, Cho JY, Lee J. Antibacterial effects of afzelin isolated from Cornus macrophylla on Pseudomonas aeruginosa, a leading cause of illness in immunocompromised individuals. Molecules. 2014;19:3173-3180. Wei Y, Xie Q, Fisher D, Sutherland IA. Separation of patuletin-3-O-glucoside, astragalin, quercetin, kaempferol and isorhamnetin from Flaveria bidentis (L.) Kuntze by elution-pump-out high-performance counter-current chromatography. J Chromatog A. 2011;1218:6206-6211. Lee YS, Lee HS, Shin KH, Kim B-K, Lee S. Constituents of the halophyte Salicornia herbacea. Arch Pharm Res. 2004;27:1034-1036. Dash S, Nath LK, Bhise S. Antioxidant and antimicrobial activities of Heracleum nepalense D Don root. Trop J Pharm Res. 2005;4:341-347. Benedec D, Hanganu D, Filip L, Oniga I, Tiperciuc B, Olah N-K, Gheldiu A-M, Raita O, Vlase L. Chemical, antioxidant and antibacterial studies of Romanian Heracleum sphondylıum. Farmacia. 2017;65:252-256. Harborne J, Williams CA. Flavonoid patterns in the fruits of the Umbelliferae. Phytochemistry. 1972;11:1741-1750. Dixon RA, Paiva NL. Stress-induced phenylpropanoid metabolism. Plant Cell. 1995;7:1085. Kusano M, Tohge T, Fukushima A, Kobayashi M, Hayashi N, Otsuki H, Kondou Y, Goto H, Kawashima M, Matsuda F. Metabolomics reveals comprehensive reprogramming involving two independent metabolic responses of Arabidopsis to UV-B light. Plant J. 2011;67:354-369. Roberts MR, Paul ND. Seduced by the dark side: integrating molecular and ecological perspectives on the influence of light on plant defence against pests and pathogens. New Phytologist. 2006;170:677-699. Komissarenko N, Satsyperova I. Flavonoids and coumarins of leaves of Heracleum antasiaticum Manden. Rastit Resur. 1974. Cushnie TT, Lamb AJ. Antimicrobial activity of flavonoids. Int J Antimicrob Agents. 2005;26:343-356. Burda S, Oleszek W. Antioxidant and antiradical activities of flavonoids. J Agr Food Chem. 2001;49:2774-2779. Kaul TN, Middleton E, Ogra PL. Antiviral effect of flavonoids on human viruses. J Med Vir. 1985;15:71-79.